Two non-fitness-related questions I’m asked most often are: “When will you be on SharkTank?” and “Are you going to do an infomercial?” Our SharkTank date is TBD. We have no plans to advertise on television… yet. Recently, I met fitness television sensation John Basedow, known by many of you for his iconic Fitness Made Simple commercials. Basedow and I spoke about his experience going from a self-described pudgy kid to a fitness icon. Basedow wasn’t born fit and he wasn’t born simple. In school, Basedow excelled, particularly in math and science courses. “My number one subject was biology. I was a bookworm. I studied as hard as I could.” He was called a “nerd” and bullied by other students. Basedow graduated as the salutatorian of his high school class and went to Williams College, widely-considered the nation’s top liberal arts college. Basedow’s first love was television. He described television as his biggest passion and driving force. Basedow was mesmerized by shows that were both entertaining and changed lives for the better. In particular, Basedow was deeply inspired by television personalities Oprah Winfrey and Joel Osteen. At the time, he wasn’t fitness-focused and had no ambition to be a fitness pitchman like Jack LaLanne or Tony Little. Gaining More than the "Freshman 15"
Like many college students, Basedow wasn’t very health-conscious. “I’d go to the gym,” he recalled. “But then, I would come home and have two bacon cheeseburgers and a big jug of chocolate milk and most of an Entenmann’s cake.” He wasn’t focused on being fit and he gained much more than the freshman 15 while in college. Basedow's passion for television was too overwhelming to be ignored. He filmed his first television show, Images, in his parents’ basement. The show explored unique health and medical topics, “ranging from new advances to fight the common cold to monkeys helping quadriplegics with laser beams,” said Basedow. Let’s call it entertainment more than science! The show was syndicated to over 300 stations across the U.S. and internationally. It ran for three short seasons and Basedow got to spend some time with Oprah in the process. His first experience with television success was followed by a career drought. “It was horrendous. I had no money,” Basedow said. “I had no drive with career prospects. I had nothing to come home and feel proud about. I was taking credit card cash advantages to pay my mortgage. I was a complete mess” And he still was very out-of-shape which started to bug him more and more. He set his sights on getting featured in a fitness magazine. It seemed like a long shot, but what used to be a passing fancy for getting into a supermarket magazine became an obsession. However, making the massive transformation proved difficult. He was frustrated by the contradictory advice he heard from others: “don’t eat fat,” “don’t eat carbs,” “exercise daily,” “don’t over-exercise.” He spent a full year trying all the fads, diets, and gadgets, and was frustrated with his limited progress. Basedow was pissed off. He felt he had wasted an entire year for nothing. He evaluated the entire year of trial (and mostly error) to identify which elements worked best, which didn’t work, and which could work with some tweaking. Basedow came up with a plan, including workouts, diets, and supplements, that worked for him. 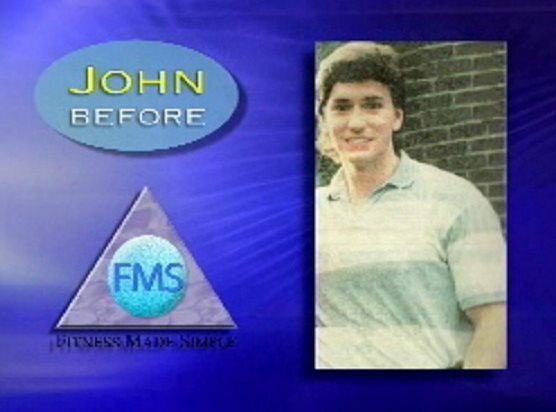 Sticking to his plan, he gained muscle, lost fat, gained confidence, and lost mental stress. He was ripped and ready to show his body off. Basedow achieved his goal and was featured in several fitness magazines. More videos followed and his program gained more exposure. Basedow became a sensation. “People were playing drinking games in hotels and bars in which people would take a shot if they could flip through the channels without seeing a Fitness Made Simple commercial,” he said. Since Basedow has tried every fitness product known to man, I was curious to see what he thought of our Core Flytes. He has his own pair and uses them for a wide-range of exercises. Basedow said, “I think Core Flytes are extremely innovative and unique. They target all areas of the core and are phenomenal for building strength, stability, and flexibility. Even for me, it’s taking time to get used to them.” I was very excited to hear that. I hope to share videos of Basedow demonstrating creative Core Flyte exercises in the near future. We’d love to hear from you. Tell us what you think about John Basedow’s story? Comment below or on our Facebook page or tweet us at @flytefitness.